• At 5:29 p.m. on Jan. 13, deputies were dispatched to the campgrounds on State Route 350 West in Clarksville after a female subject reported her brother sent text messages that “made her believe (the brother) was going to harm himself.” Deputies later located him on South Broadway Street in Blanchester. Deputies spoke with a female subject who said the male left. Deputies later entered with permission and located the male after detecting an odor of marijuana. According to the report, he was in a bedroom closet. The male was handcuffed and advised of his Miranda rights. Deputies later located loose ammunition around the bedroom. While deputies were collecting drugs and drug paraphernalia deputies discovered a 34-year-old female in the same closet crouched down. Deputies discovered she had warrants for her arrest. During a pat-down of the male subject, three knives were located in his pants pocket. Deputies located a small plastic bag of suspected meth from the female suspect’s shirt. The male suspect advised he had no thoughts of harming himself. The two were transported to the Clinton County Jail. • At 9:10 a.m. on Jan. 9, a 47-year-old New Vienna male reported his red 2000 Chevrolet Silverado was taken from in front of his residence on North South Street sometime overnight. • Deputies arrested a 40-year-old Wilmington female for alleged domestic violence after deputies responded to a domestic violence report at a residence on US 22 . According to the report, the suspect had tackled her daughter’s aunt during an argument. The aunt had temporary custody of the child as of Nov. 2018, the report indicates The suspected to deputies the aunt hit first. The daughter told deputies she saw her mother tackle her aunt. 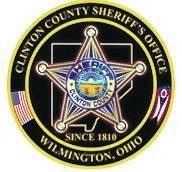 The suspect was transported to the Clinton County Jail. The report indicates there were no visible marks on either subject.